Andalusia, in Southern Spain, is a fascinating destination for wine tours with its beautiful and historic Sherry wine cellars clustered around Jerez, its stylish new vineyards around Ronda and up-and-coming wine estates near Arcos de la Frontera. Andalucía (as it is known in Spanish) is an enormous region, stretching from Huelva in the west (on the Portuguese border) to Almeria in the east. It offers a varied range of landscapes in between, of snowy peaks (of the many mountain ranges such as the majestic Sierra Nevada), desert scenes, olive groves, dramatic coastlines and the marshy nature reserve of Doñana. The first vineyards in Spain were planted in Andalucía around 1100BC by the Phoenicians outside the town of “Gadir” (modern-day Cadiz) in what is now known as the Sherry wine country. On this fabulous luxury wine tour, you will visit some of the Sherry “bodegas” along with boutique estates sprinkled throughout the region. You will learn all about the Sherry Triangle of Jerez de la Frontera, El Puerto de Santa Maria and Sanlúcar de Barrameda, and you will taste a dazzling array of Manzanillas, Finos, Amontillados, Olorosos, Palo Cortados, and Pedro Ximenez. You will have a private chauffeured Mercedes throughout the tour and so you can sit back, relax and enjoy the “vino”. Your tour begins in Málaga, and over the course of the next week, you will visit some extraordinary places including the Moorish citadel of Córdoba, romantic Seville, the mountain hamlet of Grazalema, and the breathtaking little village of Ronda. You will receive VIP private tours and tastings at a number of prestigious wine estates such as Alvear in Montilla-Moriles, Sandeman, and Lustau in Sherry, and Vicente Taberner’s wonderful Huerta de Albalá in Arcos de la Frontera. Dining is always an important aspect of our wine tours and you will have a wide range of gastronomic experiences from Michelin starred dining to rustic and authentic tapas. Andalucía produces many ultra-high quality local products that even have a protected appellation like strawberries from Huelva, raisins from Málaga, asparagus from Huétor-Tájar, Jamón (Spanish Ham) from Trevélez and exquisite olive oils from Baena, Priego de Córdoba, Cazorla, and the Sierra Mágina. Private art guides in various towns on this tour will entertain and teach you all about Andalucia’s multi-cultured history, evident in ubiquitous every day foods you might try here like “pan con aceite” (country bread toasted and doused in olive oil, of Jewish origin) and “Churros” (kind of donuts without the hole, of Arabic origin). Your quaint hotels are located in privileged positions (such as on a clifftop in Ronda, with stunning views) and you will have free time to do plenty of exploring on your own. If you are looking for an upscale private tour of Southern Spain and love food and wine, contact us for more information! Arrive at Málaga airport, where your elegant driver guide will be waiting for you. Journey into downtown Málaga for a walk up to the beautiful Alcazaba, the Ancient Moorish fortress built between the 8th and 11th centuries, when Málaga was the principal port town for the Moorish kingdom of Granada. Walk along the fortified castle walls and admire the keystone archways and delightful gardens. Next stop this morning- Córdoba. You will drive northwest for about two hours and go straight to lunch. We have a treat for you today- a full tapas tasting menu at the mythical Bodegas Campos. Taste dishes like alcachofas naturales al aceite de oliva y vino de Moriles (artichokes cooked in olive oil and wine), Salchichón de Pozoblanco (Andalusian cured salami-like ham), Ensalada de naranja con bacalao (orange and salt cod salad) and Alfajores (sweets made with honey and almonds, an ancient Arabic recipe). After a revitalizing lunch, your private art guide will meet you at the restaurant and take you on a superb walking tour of Córdoba. Established by the Carthaginians, Córdoba came to fame under its Moorish rule. 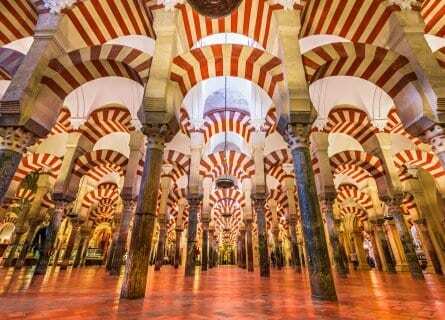 During the height of their power in the 10th century, Córdoba was known as the New Athens and had over 1000 mosques, 900 baths, 50 hospitals, and Europe’s first university. Córdoba gave Europe and the world many scientific inventions and made dramatic advances in medicine, philosophy, and art. During this period of Moorish rule, the Jews, Christians, and Moors of Córdoba lived with noted religious tolerance, coined the “Convivencia”. You will visit the “Mezquita” (the 8th-century Mosque and one of the wonders of the Ancient world, now a Christian church), and you will stroll through the lovely gardens of the Alcázar de Los Reyes Cristianos. Enjoy a walk up the Callejón de la Flores”, one of the prettiest whitewashed laneways decorated with bright flowers. In the late afternoon, your driver will collect you and take you to your hotel, located in a beautiful 16th-century noble palace, with luxurious and contemporary décor. Check in, relax and the evening is yours. We suggest you go for a walk around the Jewish barrio and have some Spanish tapas and wines for dinner tonight. Today you will travel about 40 minutes south of Córdoba to the historic village of Montilla where you will spend the morning wine tasting. While similar to sherry wines, the wines of Montilla-Moriles are not fortified with alcohol. The wines here are fermented naturally into high-strength wines and then left to age in the traditional “Tinajas” (huge Ali Baba style clay amphora). The main grape in this appellation is the Pedro Ximénez (also called “PX”), with smaller quantities of Moscatel, Airen, Torrontes and Baladí grapes being used. 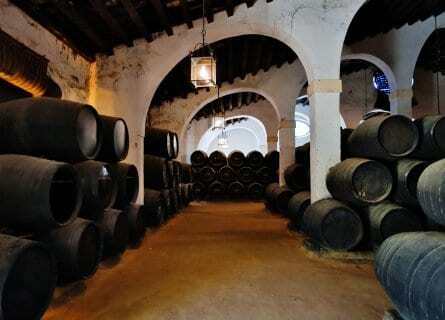 You will begin your Montilla wine tour with a visit to the oldest winery here, Bodegas Alvear, founded in 1729! The cellars are supremely atmospheric with mounted oak casks, old black and white photos, and high ceilings. Amazingly, the winery is still family owned, after 8 generations. You will receive a private VIP tour and follow with a tasting of their Grandes Soleras range of high-end wines like the Amontillado Carlos VII, Fino Capataz, Fino en Rama de Añada. Next up is a visit to a contrasting, small organic winery run by the same family since the 1920s. You will have a private tour and tasting of four top wines. By now you will most likely be quite ready for lunch and your driver will take you a few miles down the road to the historic village of Aguilar de la Frontera for a traditional Spanish lunch paired with dry wines from Rueda and La Rioja. After lunch, head back to Córdoba and enjoy the rest of the afternoon and evening at leisure. We suggest the El Churrasco restaurant for dinner tonight, known for their magnificent fried fish and lamb chops. After a superb breakfast in your gorgeous hotel, check out and meet your driver. 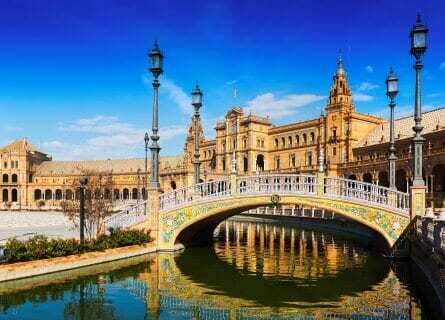 You will spend the day in Seville, Andalucía’s jewel in the crown with its alluring Arab palaces, lush gardens, Jewish Barrio and lovely, narrow streets. Drive southwest and stop just before Seville at the pretty little town of Carmona for a coffee and some photos. After a short visit, carry on to Seville. You will meet your art guide at the gateway of the Moorish Reales Alcázares y Jardines (the Moorish palaces and gardens). You will enjoy a two-hour walking tour of the historic quarter, taking in the best of Seville. Your guide will drop you off at one of our favorite tapas bars where you can have lunch on your own. Try Pez Espada en Amarillo (swordfish cooked in saffron), Potaje de castañas (chestnut stew), Solomillo al Oloroso (sirloin steak cooked in Sherry wine) and Faisán en salsa de uvas (pheasant in a grape sauce), just to name a few possible dishes you might see. After lunch, you will have free time to explore Seville on your own, see more of the sights (like the beautiful Casa de Pilatos, the highly recommended Fine Arts Museum- “Museo de Bellas Artes” and the Plaza de Toros – bullring), or go shopping (pick up Agua de Sevilla products, pretty ceramics, antiques). In the evening, you will transfer to the wine town of Jerez de la Frontera. Tonight, we have dinner planned for you at a splendid seafood restaurant, enjoy! Enjoy breakfast in the stylish dining room of your tastefully redecorated palace hotel. Today you will discover the Sherry Triangle! You will tour wineries in El Puerto de Santa Maria and Jerez de la Frontera today (both nicknamed “El Puerto” and “Jerez”)- famed for Sherry wines. 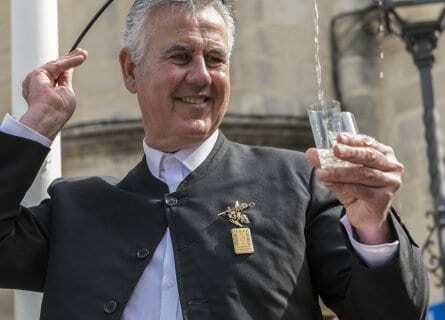 The word “Sherry” is said to have been created when 17th-century British wine importers mistakenly pronounced the word “Jerez” and inadvertently coined the name. It is called “de la Frontera” because it once stood on the “wild west” frontier between the Moorish and the Christian kingdoms. Begin your day with a visit to one of the most beautiful wineries in El Puerto such as Terry. This bodega was founded by an Irishman in 1865 and is just lovely. You will receive a private tour of the lovely grounds and caves and follow with a tasting of their sherries and a brandy. Visit their horses in the royal stables before leaving. Lunch is next, at the exceptional El Faro restaurant, a major treat. You will have a full chef’s tasting menu paired with wines from the Rias Baixas and Ribera del Duero wine regions. Relax and enjoy this long lunch in its refined setting. After the short drive back to Jerez, you will conclude your wine touring day with a second cellar visit to Sandeman. This small (in Jerez terms) cellar was created in 1790 and makes many different wines. You will have a VIP tour and tasting and taste thirty-year-old sherries, magnifico! The rest of the day is yours to explore Jerez’s old quarter on your own. For some innovative tapas tonight, head to the darling Gallo Azul restaurant. Enjoy a relaxing start to the day and in the late morning, your driver will take you through pristine vineyards and valleys to the Huerta de Albalá estate outside Arcos de la Frontera. Owned by Vicente Taberner, one of Spain’s most dynamic wine professionals, this captivating wine estate has unspoiled views of vines and olives in all directions. Vicente has an excellent winemaker from Rioja making superb dry red wines. Tour the property and learn about the grapes with the vineyard manager. Finish with a tasting of the full range of wines served with a light lunch. This afternoon you will drive to Ronda through a wonderful national park, stopping in the mountains in Grazalema. You will drive past cork trees, whitewashed “pueblos” and peaceful herds of sheep. Stop for a walk around Grazalema and do take in its shops selling woolen blankets, these are ultra high quality and considered the best in Spain. In the late afternoon, carry on to Ronda, quite possibly our favorite small town in Andalucía. Check into your hotel, located at the edge of the town overlooking the valley a hundred feet down. Relax and freshen up before dinner. Tonight, we have a splendid dinner in store for you at Bardal restaurant, this high-end dining experience by Chef Benito Gómez is to be savored. Enjoy the tasting menu paired with wines. Welcome to Ronda! Ronda cityscape on the Tajo Gorge. Ronda has in the last few years made dramatic leaps forward in the wine world. In April 2008, a high profile Wine Symposium was held here, attracting the world’s most revered wine critics such as Jancis Robinson. It brought a lot of attention to this burgeoning boutique wine industry and took the winepress by storm. Suddenly everyone was interested in Ronda and its wines. Have a fabulous day today and learn all about these up and coming wines at two of the most interesting small wineries. Chinchilla is the first stop, here after a VIP tour and personalized tasting of their terrific wines, namely Cloe Chardonnay, Chinchilla Seis + Seis Crianza, Chinchilla Doble Doce Reserva and Chinchilla Maestro (their stunning Moscatel) you will be treated to a delicious and lovingly prepared sample menu, including local cheeses and Iberian cured meats, “Salmorejo” a cold tomato soup, Battered anchovies and “Chivo Malgueño” locally sourced, roasted goat kid, finishing with almond tart and homemade bonbons made with the Chinchilla wines. Next, enjoy a wonderful private tour at the atmospheric Descalzos Viejos wine estate just underneath Ronda. This stunning estate was founded with the restoration of the 16th century chapel of the Convent of S. Trinity XVI, by architect owners Flavio Salesi and Paco Retamero. The chapel was restored to its former glory and the 15 hectares of fertile land, once belonging to the monks from the Los Descalzos Order were planted as vineyards. Argentine owner Flavio is absolutely charming and an effervescent host, he will enthusiastically lead you through the tasting of DV+09, DV Aires 09 and DV Rufina 11. Tonight is yours to relax, have dinner at your hotel or in town. This morning your driver will drive you to Málaga airport, depending on your flight time. We hope you have enjoyed yourself on this unforgettable wine tour of Andalusia. You will go home with a few personalized wine gifts and a keepsake book of the holiday. We look forward to seeing you again on another tour. The Benazuza meal was exceptional! Truly Ferran Adria is the Pablo Picasso of food. Liked the whole olive oil day very much. Cordoba was wonderful to see and I´m glad you wrapped it in as I had never thought to go there. Nines was easy to be with, very informative. We liked her very much. Great tour, great service. You were very supportive through our whole trip. Would absolutely recommend Cellar Tours.